One of the best concert tours of the season beings in December for a 12 city stint across the US. The iHeartRadio Jingle Ball tour begins in a few weeks and Epic Nation Tickets is offering discount tickets to all stops. There is only going to be 12 chances this coming December to see a host of the hottest music stars on stage together for 12 amazing shows. The iHeartRadio Jingle Ball tour lineup has been announced and music fans across the country are in for an incredible night of music at these once in a lifetime concerts. Epic Nation Tickets is now offering iHeartRadio Jingle Ball tickets for all upcoming stops along their 12 city nationwide tour. iHeartRadio is an internet radio platform that was started in 2008 and currently owned by Clear Channel Broadcasting. iHeartRadio currently delivers music to over 800 Clear Channel Broadcasting owned radio stations across the country. The iHeartRadio Jingle Ball brings together top artists from the pop, top 40, and hip-hop/R&B world to 12 cities across the country where local iHeartRadio affiliates sponsor the show. For iHeartRadio Jingle Ball tickets, fans are encouraged to purchase tickets form Epic Nation Tickets. Given the lineups expected to be at the iHeartRadio Jingle Ball and the fact there are only 12 concerts, iHeartRadio Jingle Ball tickets will be in high demand. The iHeartRadio Jingle Ball lineup this year features some of the most popular and controversial singers of 2013. Expected to perform at some of the 12 shows will be a group of artists including Miley Cyrus, Robin Thicke, Pitbull Selena Gomez, Flo Rida, Enrique Iglesias, One Republic, Paramore, Fall Out Boy, Macklemore & Ryan Lewis, Chris Brown and more. The iHeartRadio Jingle Ball Tour will begin on December 2 in Dallas and end on December 20th in Miami. Look for the iHeartRadio Jingle Ball at a city near you. 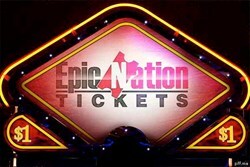 Epic Nation Tickets is the best source for tickets to sports, concerts, Broadway shows and Las Vegas acts. All ticket transactions come with a 125% guarantee and impeccable customer service.